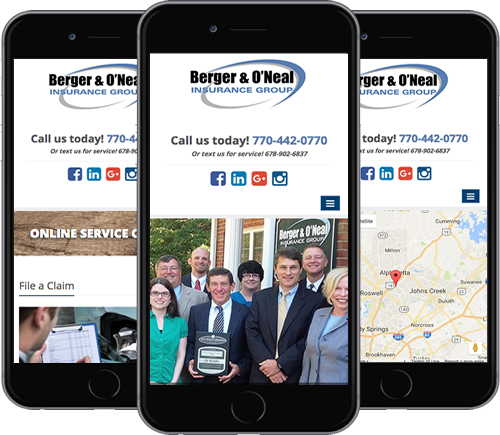 Berger & O'Neal Insurance Group – Local, Independent, Trusted. Berger & O'Neal Insurance Group is independently owned and locally operated to handle your insurance needs. We focus on Alpharetta and offer affordable and reliable insurance choices all across Georgia. We will help you find the right combination of tailored, personalized insurance coverage at just the right price to fit your needs. Berger and O'Neil Insurance Agency is Awesome! Both Michael and Janelle are the best in making sure the Cincinnati Insurance, who are the best insurer I have ever had to work with. Rick Cofer from Cincinnati is great as well. I would recommend both for anyone looking for top notch insurance support. Love this insurance group. Handled my mortgage closing and fixed the… issue the attorney created. They are very professional and I recommend them to everyone. So far I’m having a great experience with Berger & O'Neal. Welllll………as great as having to buy new insurance policies can be, which is never fun. I worked with Janelle Martin who gave me quotes weeks ago. She knew just when to check back in with me without pestering me to death. As I said, weeks ago. Janelle waited until we had explored all options and once we made our decision to go with B&O, she made it painless and handled everything online. Even printed up the cancellation notices to send to Nationwide whom we had been with for OVER 30 YEARS! Looking forward to working with you guys. Thank you Janelle for all your help with this difficult transition. I met with Michael Berger today regarding our AutoOwners Business policy renewal. We have used him for many years now and he has always been there for any questions, no matter how small. He also analyzes our policy annually with attention to detail, making sure we are getting all of our discounts.